UK police have confirmed a British teenager has been arrested in connection with a terror plot inspired by the Islamic State to attack a First World War commemoration event in Australia. The boy, reported to by 14-years-old, was held on suspicion of preparing acts of terrorism at an address in Blackburn in the north of England, on April 2. He was released, but arrested again on Saturday for another alleged terror offence, Manchester police said. “We have uncovered communication between an individual in the North West and a man in Australia to what we believe is a credible terrorist threat,” said Detective Chief Superintendent Tony Mole, from the North West Counter Terrorism Unit. He added there was no immediate threat to the public in Britain. 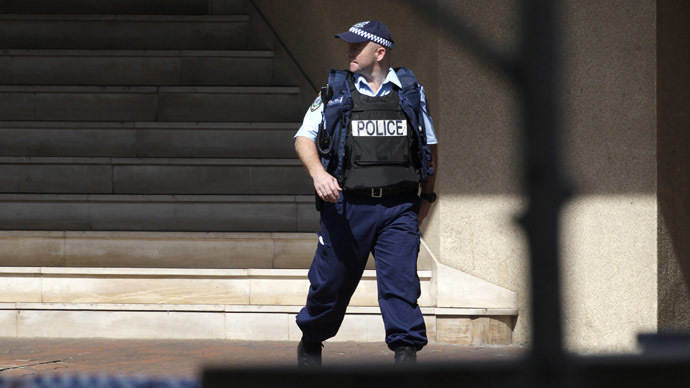 The news follows the arrests of five teenagers suspected to be planning terror attack on Anzac Day in Melbourne. On Saturday, Australian Prime Minister Tony Abbott said youths were intending to carry out an “Islamic State” inspired attack on April 25. The date, originally marked to honor the Australian and New Zealand Army Corps who died in the First World War, but has since been expanded to commemorate the deaths of all troops killed in conflict. Two of the men were arrested on suspicion of preparing for acts of terrorism, and one was held in relation to weapons offences. The two other men were detained for questioning. Australian police said they believe the plot involved “edged weapons” such as knives and swords, and was inspired by the Islamic State. Australian Federal Police Acting Deputy Commissioner Neil Gaughan said officers have apprehended individuals planning a “violent and unprovoked attack” and pledged to continue working to control extremism in Melbourne. “At this stage we have no information that it was a planned beheading,” he added. But there was reference to an attack on police. Speaking on Saturday, the Premier of Victoria, Daniel Andrews asked the population not to use the foiled plot to foster anti-Muslim sentiment. “These people are not people of faith, they don't represent any culture,” he said. “This is not an issue of how you pray or where you were born. This is not about those issues. “This is simply evil,” he added. Australian forces are part of the US-led coalition current battling Islamic State militants in Iraq.